Sheryl Sandberg, COO of Facebook and soon to be one of the richest self-made women in the world, has a message for all those women struggling up the corporate ladder that she echoed at the World Economic Forum in Davos this week: take responsibility for your careers and stop blaming men for holding you back. Sandberg has become something of a lightning rod for women in business who are searching for a powerful role model, and though many businesswomen appreciate her call for them to "keep your foot on the gas pedal" during their careers, some have criticized Sandberg for failing to acknowledge that her path to success was paved just as much with hard work and ingenuity as it was with powerful mentors and just the right amount of good fortune that positions someone to reap a $1.6 billion windfall when a once-in-a-generation company files a $5 billion IPO. I'm a huge fan of her accomplishments and think she's a huge role model in some ways, but I think she's overly critical of women because she's almost implying that they don't have the juice, the chutzpah, to go for it...I think she's had a golden path herself, and perhaps does not more readily understand that the real struggles are not having children or ambition. Women are, in fact, fierce in their ambition, but they find that they're actually derailed by other things, like they don't have a sponsor in their life that helps them go for it. Sandberg's insistence on self-reliance strikes a familiar theme in the legends of American entrepreneurs such as Andrew Carnegie or the granddaddy of go-getters, Benjamin Franklin, successful figures who emphasize their work ethic in crafting the their personal "how-I-became-successful" mythologies. Though Sandberg might not be overtly calling the woman who's falling behind at work because she can't afford child care lazy, she is implying that the only impediment between the average working woman and the riches of corporate America is attitude and that most definitely is not true. Still, Sandberg touts a positive message and makes a point of recruiting and retaining talented women, not only as a matter of gender equality but because women drive the lion's share of Facebook traffic, accounting for 62% of all daily activity on the site as well as 71% of all fan activity. She also has a contingent of stalwart admirers who enthusiastically refer to her as "the Justin Bieber of tech," which sounds a little pejorative, but whatever, I guess Biebs is super successful for a 17-year-old father. Whatever the flaws are in Sandberg's call for women to stop making excuses for themselves, it can't be doubted that she's at least leading by example. She developed the plan that took Facebook from a site with 70 million users and no business model to one of the most buzzed-about IPOs in recent memory with annual revenues of $3.7 billion. 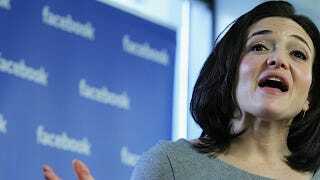 As for Sandberg herself, if Facebook's IPO is accepted, she stands to make $1.6 billion, a personal fortune that most business people, men or women, only daydream about while they're hustling to and from work.